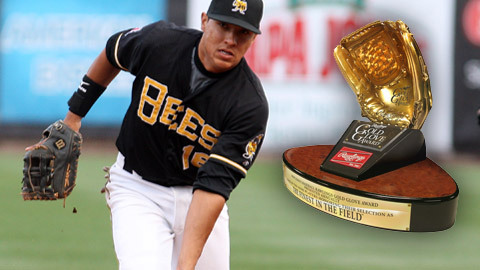 SALT LAKE CITY - Minor League Baseball and Rawlings Sporting Goods Company, Inc. announced today that Salt Lake Bees first baseman Efren Navarro has been chosen as a recipient of a Rawlings Gold Glove Award for defensive excellence at his position during the 2011 season. The winners, nine players representing each fielding position, were selected among qualifying players from the 10 domestic-based, full-season Minor Leagues. Each recipient will receive their own Rawlings Gold Glove Award, modeled after the iconic award given to Major League Baseball's top defenders. Navarro, 25, appeared in 133 games for the Bees in 2011, his first season at the Triple-A level. Setting Salt Lake defensive records for a first baseman, the lefty finished the season first all-time in total chances (1,357), putouts (1,285), double plays (140) and fielding percentage (.998). He registered just three errors in 1,357 total chances. Navarro led all Pacific Coast League first basemen in fielding percentage this past season, while leading Salt Lake to a league-best .983 fielding percentage. He also set career-highs in games played, runs scored (76), hits (156), RBI (73), total bases (240), home runs (12), triples (6) and doubles (36). The Lynwood, Calif. native earned PCL Player of the Week honors for his play during the week of August 22-28 and was named Angels Minor League Defensive Player of the Month for May and June. Originally selected by the Angels in the 50th round of the 2007 draft, Navarro made his major league debut with the Angels on September 2, 2011 against the Minnesota Twins and recorded his first major league hit on September 28 against the Texas Rangers.